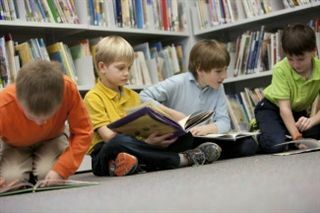 The Country School Library curriculum strives to encourage children to become energetic, enthusiastic, lifetime readers. Through story time for the younger students and by discussing reading selections with the older students, they learn about the joys of books and reading. Care is taken to assure that a wide variety of cultures and ethnicities is represented in read-alouds and in the library collection. Students learn to use the online library catalog and to find books on the shelves. Research skills are taught in library classes in conjunction with classroom or subject area research assignments. We seek to expose our students to different genres of literature and to ensure that they also learn, through literature as well as through nonfiction, about different cultures and countries. While visiting the library and reading books is certainly an excellent way to learn about a variety of topics, we strive to make sure reading is also a pleasurable, lifelong endeavor.